From being mere necessities, belts have come a long way. 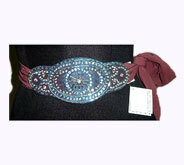 Rows of hanging beads, rich jewel tones on a belt give a baroque feel. These can be worn with both trousers and skirts. 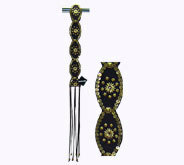 Decorated bead details on a belt worn over casual denims or formal evening wear look glamorous. 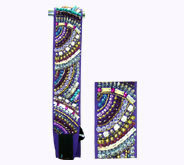 We offer a wide variety of vibrant colorful belts with fine beads and sequins lending an ethnic touch. 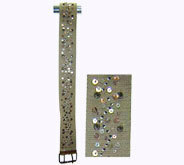 We also offer a wide range of beaded belts especially designed to suit various cuts and shapes of dresses. Available in different designs and shapes, they cater to the fashionable quest of an individual precisely. Desc : Enriched with brown, blue and white colored beads in appealing pattern, these women's beaded belts perfectly go well with jeans & skirts and enhance the persona of the wearers. Desc : Extremely beautiful and resplendent are the right words to define these beaded leather belts, which are manufactured by our skilled workers with subtlety and toil. 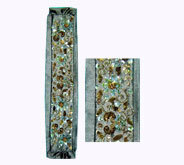 Desc : White colored glass beads have been enchantingly studded in these fabric beaded belts. These belts will surely draw the attention of beholders towards the wearers instantly. 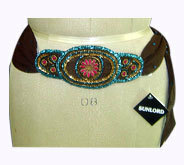 Desc : Gleaming beads of red, blue and golden colors create an eye catching designs in this fashion beaded belt. 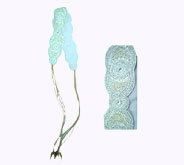 These beaded fabric belts can be tied around the waist with ease & style. Desc : Multi shaped beads and sequins of different shades make this wide sized & gray colored beaded fashion belt splendid piece of beauty. Desc : Golden & green hued sparkling beads have been fascinatingly arranged in rows to render this designer beaded belt more charming and chic. Desc : Radiating the fragile beauty in the environs, Indian beaded belts having mesmerizing patterns of colorful beads can be worn with matching purse, jewelry, slippers & outfits to look beauty queen. Desc : Golden colored lustrous beads on black background represent an unique charisma. 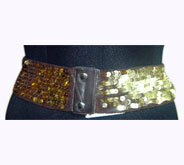 This ladies beaded belt makes a dramatic fashion statement with its bewitching look.